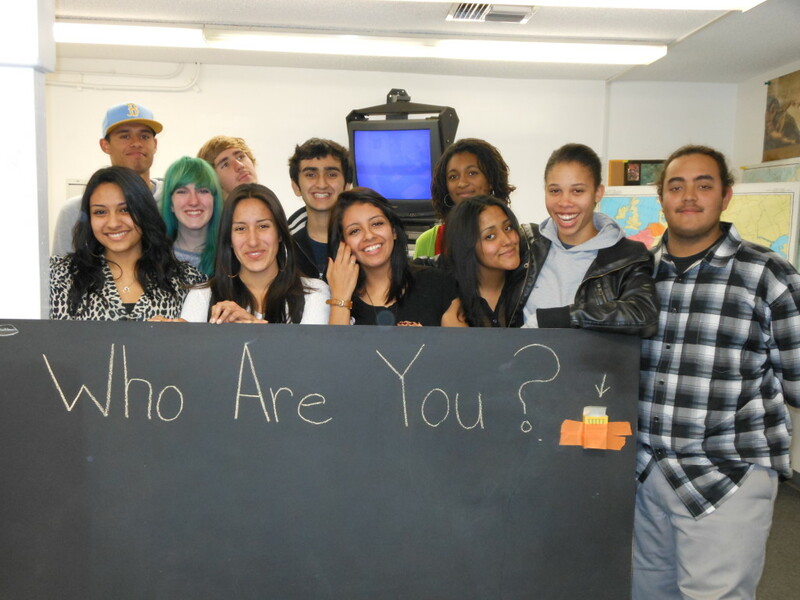 For 15 years I taught a Cultural Diversity class at Crossroads School. It was part of the 12th grade history elective requirement under the category of "History, Society, and Ethics" and it was for all intents and purposes, my "Facing History Classroom." Students selected this elective to delve deeply into the history and present-day state of multiculturalism, equity and inclusion in the U.S. With so many other elective offerings, however, my class was often small- some years only 12 students were in enrolled. I always began with a student-created "code of conduct" for the class and two-weeks worth of identity activities which laid the foundation for a classroom dynamic built on trust, respect, and open communication. Two years ago, my 12th grade students were so inspired by the richness and depth of the discussions they had in class, they often remarked, "It's too bad there's so few of us in here! Other kids should be talking about the topics we discuss. More people need to be in on this conversation!" After hearing that refrain so often from the kids, I suggested we brainstorm how to widen the conversation in a way that wouldn't require that person's physical presence in our class. What my creative students eventually came up with was this- a low tech, no tech "old school" blog. "Big Paper" if you will, for the entire campus. A student in my class who was also in technical theater constructed a large chalk board by stretching canvas over a wooden frame and painting it with several coats of chalkboard paint. Using nothing more than a paper cup and duct tape, we made a holder on the board for accompanying sticks of colorful sidewalk chalk. Once the board was complete, project "chalk talk" began! Each day in class, which conveniently met first period, the students devised a new "question" and wrote it at the top of the board. Approximately 10 minutes into class, when the coast was clear, the students transported the board to a different location on campus every day. The buzz was immediate. Where had the chalk board come from? Was it some kind of prank? Could they really write on it? Who was asking the questions? The Cultural Diversity class and I agreed that the student body would have to warm up to using the chalk board and that we couldn't engage them with thought-provoking questions right away. On the first two days, the question was simply, "Who are you?' This was the perfect opening hook, after all, what kid wouldn't want to write their name on a big public board in colorful chalk? The idea, of course, was to get people used to the idea of searching out the chalk board (moving it's location daily kept things "fresh") and interacting with it. A few of my colleagues were skeptical at first ("Aren't you just promoting graffiti? Aren't you going to be replacing stolen chalk every day?") but by the end of the week, things changed. Our follow-up question to "Who are you?" was "What are you?" Responses such as, "Handsome" "Bored" and "Confused by this chalk board!" shared space with truly thought-provoking answers such as "Asian and PROUD of it!" "The ONLY black kid in my grade" and "Adopted." 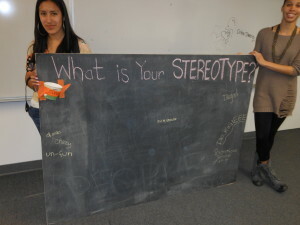 After that, the Cultural Diversity class knew they could generate conversations with project Chalk Talk. Because the chalk board was completely student generated it had a level of credibility and respect that no teacher-manufactured project would have earned. The fact that students created and transported it daily with their own hands and wrote the questions from their hearts meant something to the student body and they treated it with respect. When did I know the board was a success? ...When I heard students in my other classes talking about it. ...When I saw kids crowded around the board to write their answers and read what others had written. ...When students began to write arrows and comments to respond to things other students had posted. ...When my administrator actually came to me and said, "Where's this chalk board I keep hearing about?" ...When teachers began asking me, "Can we write on it too?" and "What if the teachers started their own chalkboard in the lounge, could we do that?" As the weeks went on it became clear to my class that they had done more than construct a chalkboard, they'd built a bridge. Although the chalk board had the physical properties of a "transportable wall," in reality, it served as a window into other people's thoughts, feelings, hopes and fears. 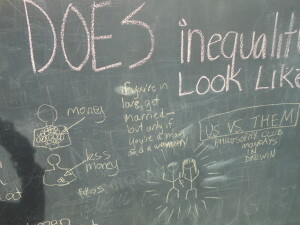 The chalkboard started conversations and connected people who might not otherwise communicate with each other. Although others had doubted the success of such a project at first, in reality people deeply desire to be asked thoughtful questions and want to be heard. The chalkboard gave the student's unheard voices both a space and a place. How do you start meaningful conversations on your campus? What opportunities can we provide for both students and adults to connect on a deeper level? When did you know you had created an environment for safe and authentic communication?